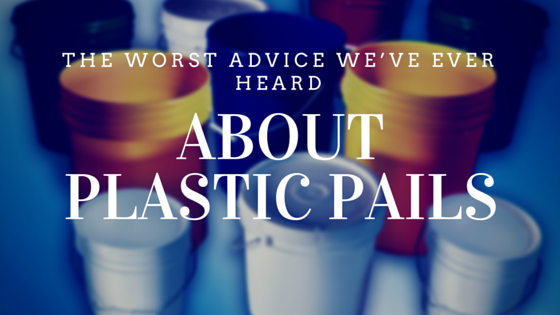 The Worst Advice We’ve Ever Heard about Plastic Pails! There are tons of types of containers, and there isn’t a single one that can take care of all of them. What makes a container useful, however, is versatility. Of the containers regularly available for both private and industrial uses, the most versatile out there is arguably the plastic pail. This is a container that can pretty much do it all as far as regular jobs go, which is why we’re always skeptical when we hear someone talking against them. Sometimes advice can be dead wrong, and here are some of the wrongest we’ve heard about plastic pails. If anyone has ever told you that plastic pails aren’t as versatile as other containers and because of this should be avoided, you need to avoid that person instead. Plastic pails are in fact one of the most flexible, versatile, and capable containers available, and that doesn’t just mean for industrial uses, either. While containers like reconditioned steel drums and glass jars are great for their own functions, you’d be hard pressed to find a container that can handle as many different things as a plastic pail. Food grade plastic pails are commonplace in restaurants and hospitals, as well as in homes for large events. Plastic pails can also be prepared to be able to handle corrosive materials and other hazardous substances, if treated properly. This of course is in addition to the industrial uses of plastic pails, from transporting to containing. However, what it can contain is as important as what it can do once it can no longer be used as a container. This advice should be taken with an industrial sized grain of salt and a couple shots of penicillin for good measure. Plastic pails are, as the name indicates, plastic. This makes them very durable, even after they are no longer fit to contain things. While plastic pails can very easily be recycled and reconstituted, they can also be quickly and easily changed to serve any number of other functions. They can be turned into molds for construction work, used for school projects, and even altered to serve as tools for gardens. With plastic pails, you don’t actually have to get rid of them once you’re finished—you can change them into something else and they just keep on going. Plastic pails are some of the most versatile, durable, and reusable containers out there. They’re incredibly convenient and they can take on a variety of jobs, which is why you see them everywhere from the meat locker of a restaurant to the beach where it’s being used to build sand castles. They live long lives and serve their purpose well, whatever it is you might need them for, and once they’ve run their time they just keep on giving. Plastic pails might not be for every job, but if you’re not doing anything too out of the ordinary you can bet safe money on plastic pails being able to handle the job. Friends don’t let friends bad mouth plastic pails.